Thread: What is the most desirable military watch? A very subjective question, depending upon how you define "desirable". It does not necessarily mean the most valuable or even the rarest; for example, SwAF Lemanias make Rolex milsubs look positively common in terms of numbers (surviving SWAFs are believed to be in the low single figures) but their values are poles apart. Last edited by StampeSV4; 03-02-2010 at 12:24. Welcome, watchgoddess. Please introduce yourself and tell us what's in your collection and wish list - no-one here bites, apart from Al' when he puts his teeth in ( ), the big "A" in ATG. One UK dealer would certainly agree with you on the IWC, seeing how he's asking nearly £10k for one. Do you own one? Look forward to hearing more from you and seeing some photos of your collection. Last edited by StampeSV4; 02-02-2010 at 15:19. I am not sure that the testing for the MK11 makes it the highest spec tested, tough as old boots and accurate etc. Rather more like that details of the testing of the watch have been available for people to find out about for some time. It wouldn't surprise me to find out that a cockpit clock for measuring flight hours on an airframes is more accurate or a small indicator clock for timing fuel transfer from one tank to another is also more accurate if we ever got to see the spec and the testing requirements. I have been involved with vintage watches for a long time and while I can say with confidence that the Rolex 5517 military sub was never specked with an orange dial I am not sure I could make such a claim for testing and accuracy of any watch. However I do applaud you for doing so and would defend 'to the death' you right to do so... BRAVO! 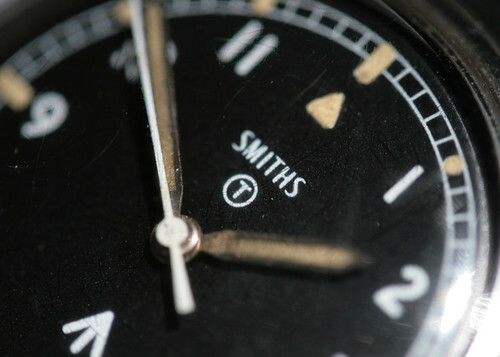 I still think that the Smiths W10 is one of the most desirable of all military watches. It wasn't the first W10, nor the most rugged (hacking survivors seem to be few and far between); it's not the most water-resistant, nor the largest (at 36mm it's positively svelte). But I'd like to think that it's the most charming, which may seem an odd word to use to describe a functional watch designed for military usage. But you must admit that it really is quite lovely, lacking as it does, the quacking duck of many pilot watches, or the overly large dials and onion crowns. It's understated, and almost delicate, with (literally) a heart of gold (I guess they must have been a loss leader for Smiths at the time). It's a bit of a contradiction, but I find that seeming incongruity quite attractive in a military watch. As I've said before on the main forum, I was really looking forward to the re-issue. But it appears to have lost something in translation into the modern world. Hey ho. Last edited by StampeSV4; 10-02-2010 at 21:36. Before delivery to the RAF every individual watch was made to undergo an extremely tough 44 day test program for use as a navigater wrist watch. In the course of these tests it was subjected to temperature variations of -5 & +45c. It was timed in 5 positions. These position tests were unprecedented and only applied to the IWC MK11. They are hugely more severe than the BUREAUX SUISSE CONTROLE OFFICIAL DE LA MARCHE DES CHRONOMETRES even with mention. The Rolex 5517 military sub - whilst a superb divers watch - it was only considered necessary to fit the standard non chronometer calibre. This calibre at that period used a different balance, balance spring etc to the Rolex chronometer movement. The mechanical cockpit clocks and small indicator clocks for fuel transfer were never made to this kind of precision - it was not necessary. For servicing initially the IWC MK11 were so precise they were only allowed to be sent back to the manufacturer for servicing (imagine the cost to the taxpayer). I find it hard to think of another military watch that was tested to these levels. Thank you for defending "to the death" my rights !! Thanks - but the question was "What is the most desirable military watch" your list of possible complications, grande complications etc are never applied to military watches. The IWC is a navigators wrist watch and this is what it was used for. At mach 2 + in an English Electric Lightning the most important thing for the timepiece is simplicity, legibility and precision. The cockpit is also a tight fit - the IWC is big enough. Perhaps we could have "What is the best military chronograph" - a functionable complication!!! lol.... you are of course correct...I still can't get over the IWC being so small and i am sure there is another mil watch that is as tech....perhaps the IWC is most tech watch of it's time..? No it's not Rebecca - it is Jessica.